While Android is easily the world’s most popular operating system with no close competitor in sight, when it comes to the U.S. it’s a much closer tie with Apple. And the latest data show that U.S. households are spending more and more on Apple devices each year. The average U.S. household spent a whopping $444 on Apple products in 2011, a huge growth from the $295 average in 2010 and nearly triple the $150 spent in 2007, according to Morgan Stanley analysis. A recent Reuters article publicized the figure and called out on Americans for paying the ‘Apple tax.’ And while tax might be a bit too strong of a word to describe users’ wilful purchases, the amount spent on Apple products is staggering. Online discounters from CouponCodes4U.com claim $1 out of $25 spent on technology, is spent on Apple devices. No wonder American economy is in shambles...the americans arent making smart purchase decisions anymore! And yup its Apple tax alright...the way Apple has monopolised its products and services to work only with each other...once you buy one Apple product you have to buy all of them and their services...Apple Tax! Does this include prices with contract or unlocked? That might change the digits drastically. people are very smart everywhere else. Since 2009, my household has not spent a single dime on any Apple products. Doesn't look like its going to change soon either. Same here. I won an iPod as a prize and promptly sold it in Craigslist the next day. No place for cApple in my house forever. 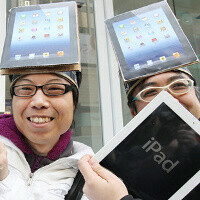 You are too Troll to buy apple products. Don't lie. Good for them. No Apple products in my house either. Why is this story even relevant when we're at the end of 2012; did they use Apple Maps to compile the data (cuz' they're kinda' late). As an average, my household has spent $0 on Apple products for 20+ years. Seems like Americans took, 'an apple a day keeps the doctors away' too literally. It is not surprise that American buy American product my friend :) I believe you love your country's product more than the others right?? American product..? Since when is a product engineered in Asia, and built in Asia by Asians an American product ? Thats one thing apple knows how to do well, making profits. Even if they sell less devices they are still doing good because they make so much money off of each device. Apple is planning ahead and is in it for the long run. I wonder how Google and everyone else will adjust to apples new strategies. Woo! its like majority of americans bought the same type of clothing, cars and furniture either in white or black. Ha! ha! ha! how boring.